THE ALTIPLANO IS A high plateau located in the central ANDES region of South America at an altitude of about 13,123 ft (4,000 m). It reaches into parts of PERU, BOLIVIA, CHILE, and ARGENTINA. On the west, it bounds the Cordillera Occidental and borders the Cordillera Oriental on the east. It is surrounded by volcanoes reaching altitudes of 19,685 ft (6,000 m), whose activities have caused landfalls that are responsible for the reshaping of this large plateau. The Altiplano has an area of 105,633 square mi (170,000 square km) that is volcanic in origin. Lake TITICACA is the lowest point of the Altiplano, and occupies its northern basin. It is located at an altitude of 12,500 ft (3,810 m). It has an area of 5,632 square mi (14,587 square km) and reaches depths of 1,214 ft (370 m), making it the highest navigable body of water on earth. The large volume of water makes it possible for the lake to retain a stable 50 degrees F (10 degrees C) temperature. The lake plays an important part in affecting the surrounding climate. The southern basin of the Altiplano is occupied by shallow salt lakes and flats. Lake Titicaca drains into Lake Poopo through the Desaguadero River. Lake Poopo, which is a shallow saltwater lake whose depth rarely reaches more than 13 ft (4 m), is dependent on the flow of water from Lake Titicaca and seasonal rainfall. One of the largest salt flats in the Altiplano is the Uyuni Saltpan. It is all that remains of an ancient lake that covered an area of 5,592 square mi (14,483 square km). Today, this saltpan is filled with salt, which can be as deep as 16 ft (5 m). The Altiplano’s climate is characterized by a long dry season, lasting from April to November, and a short wet season. The wet season is from November to March, when 95 percent of the rainfall occurs. The amount of rain decreases from northeast to southwest. This is possible since a rain shadow effect is created that allows the northeast to receive more water. The Cordillera Oriental, for example, receives about 51 in (130 cm) of water annually, while the southern Antiplano receives only 6 in (15 cm). The atmosphere here is more transparent to radiation because of the greenhouse effect. This causes an increase in nighttime heat loss, which is noticeably greater than the rate at sea level. The ultraviolet radiation is 20 percent greater in the Altiplano than the radiation at sea level. The highest temperatures during the summer are measured in late November, reaching 68 degrees F (20 degrees C) during daytime and falling to near 5 degrees F (-15 degrees C) at night. During the winter, June to August, mean temperatures reach as high as 55 degrees F (13 degrees C) and fall to 12 degrees F (-11 degrees C) at night. Strong winds are common in the Altiplano, reaching 62 mi per hour (97 km per hour). They are present nearly every day and are usually stronger in the afternoon. The Altiplano ecosystem has a dry STEPPE climate, predominated by grasses. The lack of oxygen in the high altitudes of the Altiplano allows only a few plants and animals to survive. Some of the animals living in the region are condors, flamingos, different species of cameloids (e.g., American camels), llamas, alpacas, and many bird species. The Altiplano is also home to the quenoa tree, which grows at an elevation of over 11,500 ft (3,500 m). 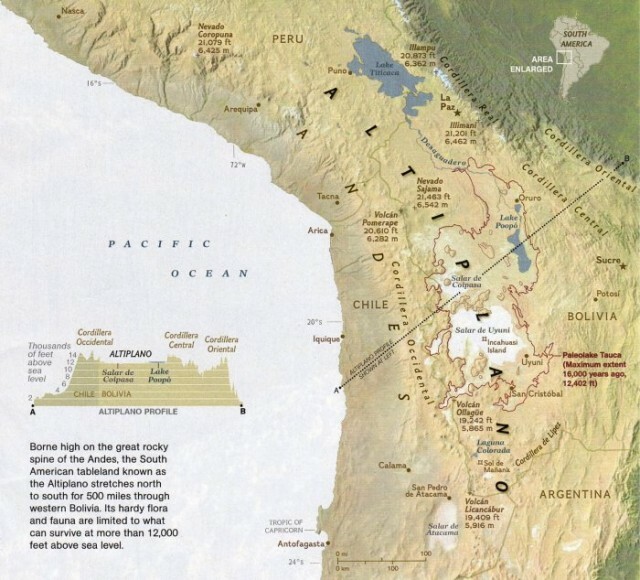 The Altiplano has been home to the Inca peoples. Today, some of its areas are populated by Aymara natives. Since the Inca’s time, the plateau has seen much mining: Gold and silver are two of the metals sought by miners and mining companies. Other natural resources include tin, natural gas, petroleum, zinc, tungsten, antimony, silver, iron, and lead. Mining has been the source of pollution to the air, water, and soil in the Altiplano.